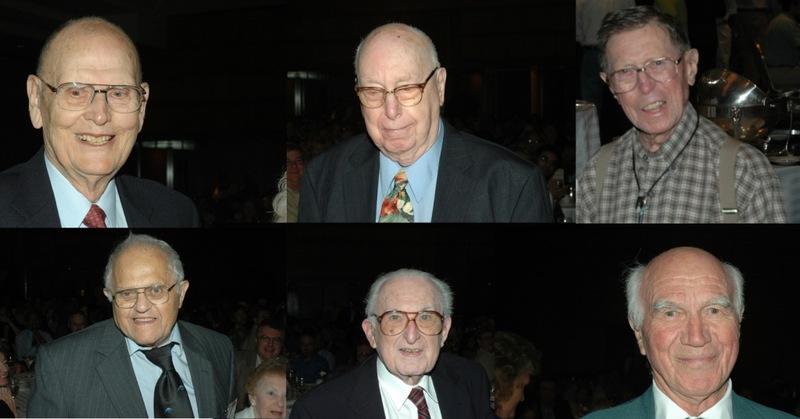 Founding Members who attended the 2007 annual convention in Washington, D.C.
What is the biography project? The purpose of the project is to preserve biographical information on persons who have contributed to poultry medicine for succeeding generations of scientists and historians interested in poultry medicine. Who should submit a biography? Any person, living or deceased, who has made significant contributions to poultry medicine or the AAAP. All submissions will be accepted. Self-contributions are encouraged, especially from persons at or beyond retirement age. What should I submit for a biography? A curriculum vita, including critical dates, education, employment, special assignments or contributions, and a list of publications (no reprints). A photo, preferably a professional portrait photo (3"x5" or 5"x7"). A reflective statement written in the style of the "Reflections" articles published in the AVMA Journal describing major career events of historical interest and providing a perspective on the personality of the author. To every career there is a professional and a personal side. The reflection is meant to include the personal side of the story, not the answer to 'what was done' but 'why was it done'. It is an opportunity to record your side of things, how things actually happened, your gratitude to mentors, or words of wisdom for those who follow you. We will help you with editing for grammar or style, (if you want) but the content is up to you. Writing a reflective statement. How to submit a biography. A member of the History of Avian Medicine Committee will be assigned to help each subject gather materials or answer questions about their biography or the biography of a colleague. What happens to a biography once it is submitted? A copy of each biography is kept with the AAAP's history committee. Selected reflections from submitted biographies. References for JAVMA published "Reflections" written by AAAP members. DeLay, P. Far removed from the Iowa "cow war". JAVMA 210:620-2. 1997. Shor, L. Variety, the spice of industrial veterinary medicine. JAVMA. 203:1529-31. 1993. Bullis, K.L. Dedication to avian studies. JAVMA 199:864-7. 1991. Hitchner, S.B. Blending business and research in avian medicine. JAVMA 198:1526-30. 1991. Rosenwald, A.S. Fifty years with feathered food animals. JAVMA 195:1490-6. 1989.